IT HAS been almost a week since we last wrote about the thug or the bully called Željko Topić. He is still Vice-President at the EPO, which is rather amazing given the criminal charges that he faces and the generally outrageous background that he comes from, allegedly involving bribes and other serious abuses. Topić is Benoît Battistelli’s right-hand man, so Battistelli’s tyrannical tendencies should come as no surprise (or conversely, the appointment by Battistelli should come as no surprise). 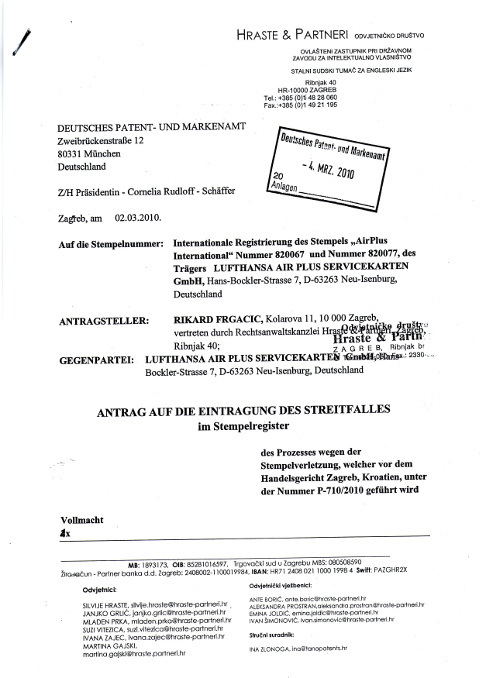 Rikard Frgačić has fought against Topić's abuses for quite a few years and his comments which he sent after we had covered his case highlighted an important name, which can see seen in the above document, implicating Željko Topić in addition to (potentially) Lufthansa. Mr. Frgačić has highlighted to us a very curious connection. Putting aside the United Nations International School (New York), as can be seen above, Frgačić urged us to “note one family name on memo-sheet of lawyer paper (on the bottom) Hraste & Partners in my article [response]. Named Ivan Šimonović, he is a son of the assistant secretary of Ban-Ki-moon, gen. Sec. of UN in New York. His father has the same name. “By the way, Ivan Šimonović assumed his functions as Assistant Secretary-General for Human Rights on 17 July 2010, heading OHCHR’s New York Office. “Topić has a lot of power (to abuse) because he is conveniently connected to rather powerful people.”“If you follow Croatian diplomatic network you will found his wife (or his mother) Dubravka Šimonović in Croatian UN & OSCE mission in Vienna (see Diplomatic Missions and Consular Offices of Croatia). “Its means that this “company” have (Željko Topić friends) cover at 3 UN head points – Vienna, Geneva and New York. This political and horror theme may be published in a stronger daily newspapers or weekly magazines.